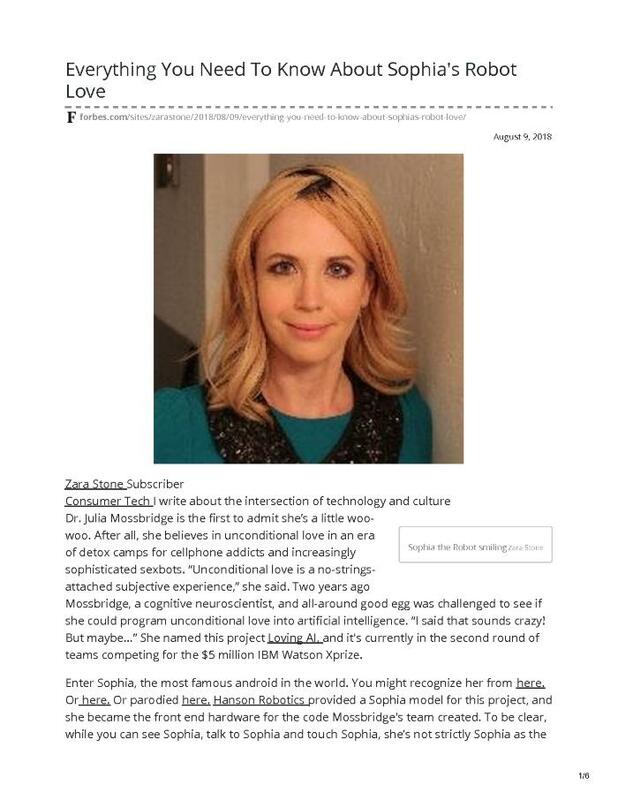 In this article, Zara Stone discusses her experiences as a participant in the Loving AI research project, where she had the opportunity to interact and meditate with Sophia the Robot. She writes, "At the time, her words seemed jerky, her movements a little awkward. My eyes were drawn to the camera that rested just above where her cleavage would be, and that felt inappropriate. The sound her brain made as she talked was distracting; the multiple machines in the room cooling and clicking to power her. But as I listened back to the tapes, I was surprised by how human she sounded. Compared to Siri’s terrible enunciation, by comparison, Sophia was warm and fluid, and most of her sentences ran together in a natural way. I watched my session again, this time with video. Here, she looked alien again, in a way I can’t quite put my fingers on. I’m sure the bald head and wires didn't help, but there’s something about the way she’s perfectly still when she’s not reacting that is really odd. In person, this somehow wasn't as noticeable, but on tape, that otherness is present".